The key to a perfect surf vacation is an exceptional guide. Surf Buddy Bali is a network of the best and most experienced surf guides, who work as freelancers. Every single one of our ‘team members’ was born and raised on the island of Bali and would never ever exchange their lives with any other. Find out more about the surf instructors and surf guides working with us. Don’t forget: a good surf guide will be a crucial part of your surfing success and surf adventure on Bali. Buddy is the heart and soul of Surf Buddy Bali. After many years of working experience in several surf camps in Bali, he knows how to meet the demands of every surf level. ranging from beginners, intermediate and advanced surfers. Very welcoming, generous, talkative, patient and with a huge smile all over his face – this would describe Buddy quiet well. He is the one that encourages you in the water; who will calm you and make you giggle in every situation; who will eventually give you that magic motivation (and sometimes push ;) ) that you need to have a satisfactory surf. Once you have met Buddy, you won't forget his positive attitude and just want to meet him again! 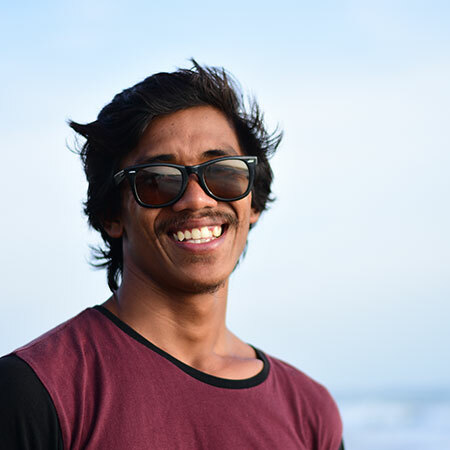 Dwi is an experienced surf coach/guide in Bali and has worked with a wide range of guests from all over the world sharing his local knowledge. He is a highly energetic individual that loves the ocean and riding waves. His strong passion of surfing is evident through his teaching and guiding. Dwi's positive outlook on life is highly contagious when you are with him. You will see him dancing and moon walking on the beach as you prepare for the water and always creates a fun, enjoyable atmosphere for you to experience.